Should pre-K teachers have degrees? A recent New York Times Magazine article looks at both some of the challenges facing early childhood teachers and the debate over whether or not policymakers should raise education requirements for them. I explored these issues further last week in U.S. News & World Report — but I also wanted to comment on the Times piece’s coverage of New Jersey’s Abbott pre-K program. Times author Jeneen Interlandi highlights New Jersey’s Abbott pre-K program, which both requires all pre-K teachers to have a bachelor’s degree and pays them comparably with public school teachers. This practice is in sharp contrast with the norm of low education requirements and pay in many other early childhood settings. A little background here: In the 1990s, a court first ordered New Jersey to offer universal pre-K to three- and four-year-olds in thirty-one high-poverty districts and, later, to ensure that teachers in those pre-K programs held both a bachelor’s degree and state certification. 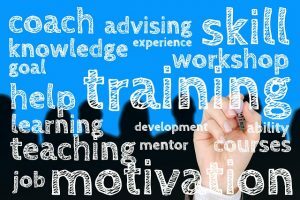 As Interlandi argues, the strategies New Jersey used to meet that requirement offer lessons for other efforts to elevate the skills and training of early childhood teachers. 1. Pre-K is pretty much the only part of the Abbott program with evidence of demonstrable, lasting benefits. New Jersey’s Abbott preK was the result of the long-running Abbott v. Burke school finance litigation. Besides mandating pre-K, various Abbott decisions required the state of New Jersey to increase spending in poor districts, repair school facilities and reduce overcrowding, and cover costs of supplemental services to address the needs of children in concentrated poverty. Billions of dollars have been spent on these efforts. Yet there is no clear evidence that they resulted in improved outcomes for students in high-poverty. Abbott Pre-K, however, is the exception. Interlandi writes: “Abbott studies show fade-out effects, albeit less significant ones than in many other preschool studies.” This statement, while technically correct, underplays the evidence of Abbott pre-K’s results. Research shows that Abbott children made meaningful gains in pre-K — and that a portion of those gains persisted through at least 5th grade. Interlandi is correct that the magnitude of Abbott pre-K advantage diminished over time, as some degree of fade-out is to be expected over time from any intervention. And, in the context of the Abbott results (or lack thereof) more broadly, the Abbott pre-K results are quite striking. Put another way, the Abbott pre-K results, combined with other evidence on quality early childhood programs, suggest that a marginal education dollar is more likely to generate results if spent on pre-K than if simply added to general education budgets. This entry was posted in Early Childhood Education, Talent, Teacher Effectiveness and tagged Abbott v. Burke, early childhood education, early childhood workforce, Jeneen Interlandi, New Jersey, pre-k, state-funded pre-k on January 17, 2018 by Sara Mead. I’m a big supporter of charter schools as pre-k providers. I have a daily Google alert for “(pre-k OR prekindergarten) AND charter.” No one else really writes about charter schools and pre-k, so usually this Google alert sends me news about when and where a charter school is going to accept pre-k applications. Good information for parents, but not blog fodder. Sometimes though, it’s exciting news. Like when Success Academy had a showdown over pre-k with Mayor de Blasio. Or yesterday, when my Google alert told me that a New Jersey charter school — the John P. Holland Charter School in Paterson — wasn’t allowed to open a pre-k program. Often, charter schools’ pre-k applications are rejected for bureaucratic or logistical reasons, and in response I make the case again for policy reforms that get rid of those barriers. It’s all very clean because quality isn’t a consideration, and my support for charter pre-k remains unchallenged. This entry was posted in Accountability, Charter Schools, Early Childhood Education, School Governance, State Education Policy and tagged charter schools, context, Google alert, New Jersey, news, pre-k, preschool on April 21, 2016 by Ashley LiBetti. This entry was posted in Charter Schools, Early Childhood Education, Education Innovation, Education Policy, School Choice, State Education Policy and tagged #CharterPreK, California, Charter, charter pre-k, charter schools, Delaware, diverse delivery, Funding, Georgia, Head Start, Illinois, Kansas, Louisiana, New Jersey, New Mexico, North Carolina, pennsylvania, state education policy, state funding, state pre-k on August 5, 2015 by Ashley LiBetti. Note: Several candidates are missing from this chart. The states represented by Rand Paul (KY) and Bernie Sanders (VT) do not currently have charter laws. The states represented by Martin O’Malley (MD), Lindsey Graham (SC), Jim Gilmore (VA), Jim Webb (VA), and Scott Walker (WI) were not included in the 2013 CREDO study. Charter schools are growing. The number of charter students has grown from 1.2 million to 2.9 million in less than a decade. Within two decades, a third of public education’s students – or more – could be educated in charter schools. That’s why the next president’s perspective and record on charters matters. 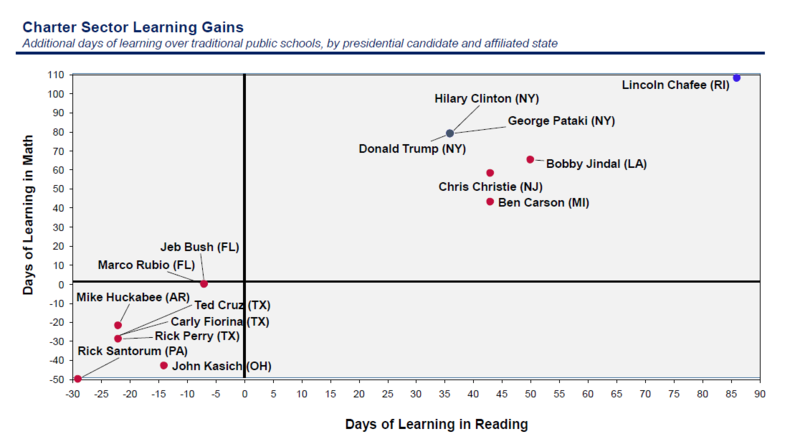 But what can we tell about the candidates based on how their states do with charter schooling? This entry was posted in Charter Schools, Education Policy, Politics of Education, Research, School Choice, State Education Policy, Student Data and tagged 2016, arkansas, assessment, Authorizers, Bush, Charter, charter laws, Christie, Clinton, CREDO, education data, florida, Huckabee, Jindal, Leadership, Louisiana, michigan, New Jersey, new york, Ohio, pennsylvania, politics, presidential candidates, Research, rhode island, Rubio, snark, state education policy, Texas, Trump on July 14, 2015 by Ashley LiBetti. This one’s for all the aspiring policy wonks. In Newark, NJ, the superintendent recently attempted to revoke the tenure rights of a group of teachers deemed ineffective. The state has a statute (“TEACHNJ”) of recent vintage permitting such things. Kind of. Well, at least eventually. One of the affected teachers contested the district’s decision, and an arbitrator sided with the teacher. It turns out that, in an arbitrator’s estimation at least, the statute technically took effect later than the district contends. Because of the exact wording of legislative language, dozens of teachers are either–depending on your worldview–being indefensibly shielded from the law’s clear intent or rightly defended from an illegitimate administrative action. If this law’s lack of specificity frustrates you, consider Section 5 of this North Carolina statute. So concerned that the state board would use its existing statutory and regulatory authority to procure an unpopular testing system (e.g. PARCC or SBAC), the legislature actually prohibits the board from acquiring any new assessment system until it is given new, explicit legislative permission to do so. The law goes even further, actually naming the kinds of tests that would probably be acceptable, (e.g. NAEP, SAT, ACT). This is the endless tug of war between legislative authority and administrative discretion. In the former, a district gets its hand rapped for trying to squeeze too much power from what it considers sufficiently permissive language. In the latter, lawmakers craft uber-specific language to prevent the state school board from using its existing power to act against the legislature’s wishes. This entry was posted in State Education Policy and tagged assessment, New Jersey, Newark, North Carolina, PARCC, SBAC, tenure, testing on November 9, 2014 by Andy Smarick. The statements on this blog are the views of the authors alone and should not be considered those of Bellwether Education Partners or of any others within the organization. Bellwether maintains an internal culture that cultivates and respects diverse points of view and does not take organizational positions on education issues. Why Is There a Disconnect Between Research and Practice and What Can Be Done About It? Is Idris Elba the Reason You Can’t Find Affordable Child Care? Copyright © 2019 Bellwether Education Partners. All rights reserved.